On February 19, 1777, aboard the warship Warren, which was anchored outside of Providence, R.I., ten American sailors and marines serving in the war met in secret. 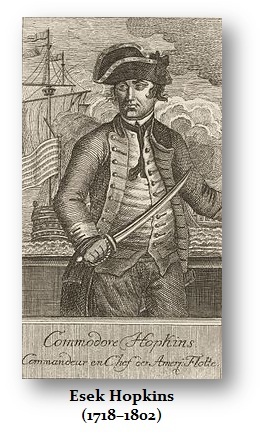 They determined it was their patriotic duty to blow the whistle on wrongdoing that they witnessed by their commanding officer who was Commodore Esek Hopkins (1718–1802) of the Continental Navy. Hopkins was from a very powerful family and his brother, Stephen Hopkins (1707–1785), was a former governor of Rhode Island and a signer of the Declaration of Independence. 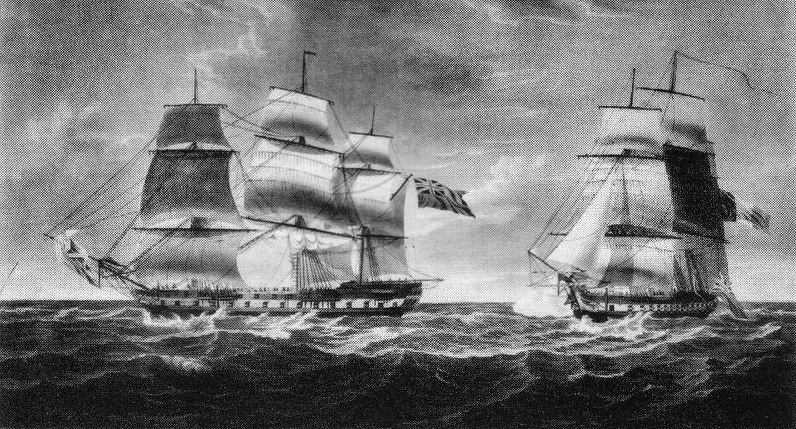 Hopkins had participated in the torture of captured British sailors. The allegations were that he “treated prisoners in the most inhuman and barbarous manner,” they submitted in a petition to the Continental Congress. The group of ten selected Marine Captain John Grannis, to present the petition to the Continental Congress and the transcript of his interrogation survives. Continental Congress voted on March 26, 1777, to suspend Hopkins from his post. Esek Hopkins was perhaps a hothead for he unwisely immediately retaliated filing a criminal libel suit in Rhode Island against the whistle-blowers involved. Two of them who happened to be in Rhode Island, Samuel Shaw, a midshipman, and Richard Marven, a third lieutenant, and Hopkins had them illegally arrested using his local family clout. The Continental Congress, unlike the entrenched political establishment today that hides whatever they desire and sees no problem torturing anyone disregarding that others are then justified to act in the same manner against an American solider captured, went even further. They ensured that the whistle-blowers would have excellent legal counsel to fight against the libel charges in Rhode Island. They then authorized payment for the legal fees of Marven and Shaw. The Continental Congress then ordered the full release of all records related to the removal of Hopkins holding that there shall be no “state secret” or privilege to shield his name. Armed with Congress’s support, the whistle-blowers put on a strong defense, and won their case in court. And true to its word, Congress on May 22, 1779, provided $1,418 to cover costs associated with the whistle-blowers’ defense. One “Sam. Adams” was directed to ensure that their Rhode Island lawyer, William Channing, was paid. Many have written asking what can we do? 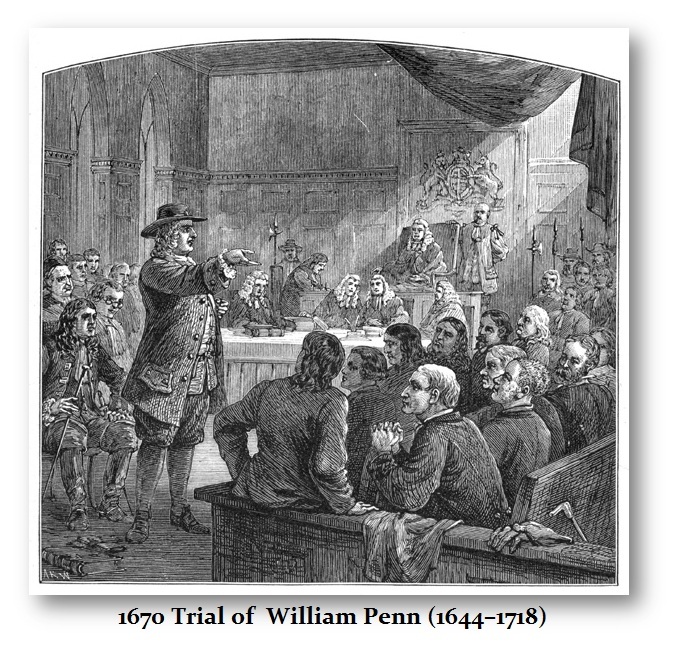 In 1670 William Penn, founder of Pennsylvania, held a worship service in a quiet street which was attended by a peaceful group of fellow Quakers. Penn and another Quaker, William Mead, were arrested on a charge of disturbing the King’s peace and summoned to stand trial. As the two men entered the courtroom, a bailiff ordered them to place their hats back on their heads. When they complied, they were called forward by the Judge, who was the Lord Mayor, and held in contempt of court for being in the courtroom with their hats on. This injustice was just getting started. Penn demanded to know under what statute they were being charged. The court refused to supply even that information and instead referred vaguely to the common law. When Penn protested that he was entitled to a specific indictment under due process, he was removed from the presence of the judge and jury and confined in an enclosed corner of the room known as the bale-dock to totally deny him a right to even put on a defense. From there, Penn could neither confront the witnesses who accused him of preaching to the Quakers nor ask them questions about their charges against him. Several witnesses testified that Penn had preached to a gathering which included Mead, but one showed some hesitancy as to whether Mead had been present. The judge turned to Mead and questioned him directly. In essence, he was asking Mead if he were guilty. Mead invoked the common-law privilege against self-incrimination. This provoked the judge who became very hostile. The court then sent Mead to join Penn in the bale-dock out of the sight of the jury and witnesses. After the testimony the court instructed the jury to find the defendants guilty as charged. Penn tried to protest, but was silenced and again sent out of the courtroom. The judge sent the jury back three more times demanding a guilty verdict and threatened to imprison them unless Penn was guilty. Finally, the jury stood its ground and refused to go out any more. The judge fined each of them forty marks, the equivalent of a year’s wages, and ordered them imprisoned at Newgate Prison until the fine was paid knowing they could not. Penn and Mead went to Newgate Prison anyway for obeying the bailiff’s order on contempt since they put on their hats. Later a writ of habeas corpus finally won freedom for the jurors while Penn and Mead left jail to and fled England sailing to America. The members of the jury, fought their case from prison in what became known as Bushel’s Case, which they managed to win the right for all English juries to be free from the control of judges. This case was one of the more important trials that shaped the future concept of American freedom yet today once again the US courts argue juries have no such right to nullify the law. In other words, if Congress passed a law saying you must kill your first born, a jury is supposed to find you guilty regardless what they think about the law. A military trial is not entitled to a jury which has been the whole issue over trying so called terrorists where they would surely never get a fair trail. So you ask what can we do? When the people refuse to comply with legal prosecutions that are wrong and anti-American in every respect as what was done to Bradley – then and only then, will the tide begin to turn. Government inevitable reverts back to tyranny. No matter what form the government may be, it rolls like a pig in its own extract drunk with being who they are.